Vienna Cardinal Dr. Christoph Schonborn arrived to Medjugorje on his private visit on Monday, December 28, and he will stay here for couple of days. Cardinal, amongst other things, wants to visit Cenacolo, the community of former drug addicts and their house in Medjugorje, since one of their houses exists in Austria as well. He emphasised that he, above other things wants to be person who prays in this famous place of prayer. Cardinal Schonborn (1945) from 1975 to 1991 is professor of Dogmatic Theology and Theology of Christian East in Freiburg, Switzerland, and from 1987 to 1992 he was selected to serve as the Editing Secretary for the pontifical commission charged with drafting the new Catechism of the Catholic Church. In 1991 Schönborn was appointed as the Auxiliary Bishop of Vienna, and from 1995 he is the Archbishop of Vienna. In 1998 he was appointed as Cardinal and elected as president of Austrian Bishop’s Conference. Today, Cardinal Schonborn is one of the most eminent experts for theology of Christian East, and member of Vatican Congregation on the Doctrine of Faith. Slideshow of Cardinal Schonborns' visit to Medjugorje 2009. (Audio after the first two minutes). Audience of Cardinal Schönborn in Medjugorje, December 30, 2009. On December 30, 2009, Cardinal Christoph Schönborn, Archbishop of Vienna and a member of the Vatican's Congregation for the Doctrine of the Faith, gave a powerful, lengthy talk at St. James Church in Medjugorje. Schönborn's talk revolved around the theme of God's mercy, and he did not hesitate to praise Medjugorje. His first words as he stepped to the podium were "Hvaljen Isus i Marija," a Croatian phrase that means "Praised be Jesus and Mary." This is a common greeting among the visionaries and Medjugorje villagers. The Cardinal repeated it several times and urged the crowd to repeat it with him. He went on to say "When you look at a place like Medjugorje, you can see a superpower of mercy. Many merciful deeds were born here or they were supported here." Delving further into the topic of mercy, Cardinal Schönborn said, "What a deep feeling of compassion there is in Jesus. Many deeds of mercy in the Church were born exactly in this way, like Mother Teresa, who couldn't accept people dying in the street. Or Mother Elvira, here in Medjugorje, the founder of Cenacalo Community rehab center: she couldn't stand to see young people on drugs, destroying their lives with drugs. What is this deep, profound emotion that we call compassion?" While concluding his talk in Medjugorje, Cardinal Schönborn said, "I believe that many experiences in the Church demonstrate something that is impossible from a human point of view." 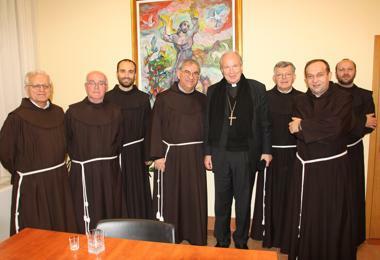 Cardinal Schönborn has been in Medjugorje since December 28. He will celebrate New Year's Eve Mass at St. James Church. The visit and implied endorsement from such a prominent Vatican cardinal is seen by many as a very positive indication of the Church's stance on the apparitions. While some had expected Cardinal Schönborn's visit to Medjugorje to be private, he has instead surprised the town by being very visible. He has spent his time concelebrating Mass at St. James Church, climbing Apparition Hill with visionary Marija Lunetti, hearing confessions, praying in silence at Adoration, and, perhaps most notably, giving his talk today in the parish church with the Franciscan friars at his side. Courtesy of Queen of Peace Productions.